A rough two weeks. My health has been my first priority to insure a complete, full recovery from the illness that felled me a little over two weeks ago. I am on the mend. Last weekend, to conserve energy, I focused on revision work for Perceval’s Shadow, feeling guilty that I had not written a blog post. Someday, I need to explore the conflict that arises among social media/email, blogs, and fiction. But it was a productive time. I managed to update two chapters’ electronic files, then revision work on four chapters. I don’t know if I’ll make my goal of finishing half the novel by December 31, but I work away at it. This weekend, I’m feeling better healthwise but caught up with month-end business chores. It’s been extremely busy at my office job, so I’ve been exhausted during the week. That probably won’t change for at least another month or so. I’m trying to get chores done today so I can focus on Perceval’s Shadow tomorrow. There really are not enough hours in the day. I’m looking forward to a four-day weekend for Christmas — my present to my writer self! I have to admit here that my first writing priority right now is Perceval’s Shadow. So, I will try to post here when I can, but please be patient and understand that I want to get the novel done and out into the world, and I’m working on it whenever I can! One of those weeks when life intervenes in ways unexpected and unwanted. I was quite ill this past Wednesday and continue to recover. No formal post here this week. I hope to be back to my usual self next week, especially with more time with the holiday to work on the Perceval’s Shadow revision! Last week I was working hard on revisions and used all my weekend time for that kind of writing rather than writing blog posts. This week it’s time to take stock. How’s the writing going this year? Any significant accomplishments? Non-writing Employment: The first three months of this year, I was working hard on the search for a fulltime job after losing the job in December that I’d landed in April 2017. In March, I accepted a fulltime position with a state health licensing board as their office administrative support. It’s a small office (only three of us) and the work doesn’t follow me home which is wonderful. It’s also far less stressful than the previous job had been. The schedule is not very conducive to writing at the computer during the week but I do an awful lot of writing in my head. Being happier and more relaxed at this job has given me more energy to pour into my writing on the weekends. I may still need to sell some possessions for my financial health which is fine — cleaning out the clutter is always good! Perceval’s Secret remains on sale (only $2.99!) at Amazon and B&N.com. After running a “Free” promotion last spring and seeing where people went to get their copy of the novel, I removed it from Kobo International. The reviews continue to be good to excellent! I’d love to hear from readers through reviews at Amazon and B&N, or at Goodreads. I continue to research and plan promotions for 2018. I participated in a BookBub promotion also last spring that increased my number of followers there. BookBub also provided a list of those followers from that promotion who are particularly interested in thriller fiction. As for the other novels in the series, I’m now starting to work on the revision of the first draft of Perceval’s Shadow, the second novel in the series. This is the year of revision work! I’m sure that as I work on the revision, I’ll also be writing notes for the other three novels in the series. It always amazes me how my opening one door in my imagination can also open other doors to other projects. 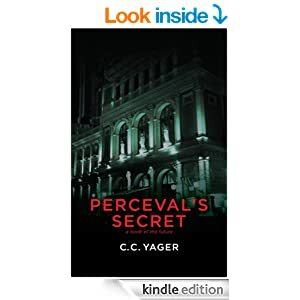 Marketing: As I mentioned above, I ran a “Free” promotion for Perceval’s Secret this past spring. I learned that most people gravitate to Amazon despite the book also being free at B&N and Kobo. I wrote about the results of this promotion and my response to it here. I’ve been happy that people at my new job have been interested in my writing. I know of one person who bought Perceval’s Secret and read it. She talked with me about her response to it and I loved hearing from her! I still need to utilize the marketing tools at GoodReads, LinkedIn and Publishers Marketplace. I continue to promote the novel on Twitter and Facebook. I’ve been writing more posts at the Perceval Novels Facebook page, too. Please go and like it, and visit often for updates on the novels. New Novel Project: This project remains on the back burner this year. I still plan to transform my original screenplay, Over the Rainbow, into a novel. I love the story, the main character, and the potential of it, so I hope to be able to work on it soon. Debt from Publishing Perceval’s Secret as an e-book: I finally finished paying off the credit card debt that I incurred when I published Perceval’s Secret. I still have substantial debt, but it’s not from publishing. I don’t know when I’ll publish the novel as a paperback. It’s still one of those things that I want to do but don’t have yet the money to do. Short Stories: Lots of success to report here! I finished the revisions of Light the Way. It is now ready to submit. I spent some time researching possible markets for it, and now I just need to pick one and start the submission process. I also finished the revisions of The Negligee. I’ve decided that this short story falls within the horror genre and I need to research markets for it. I finished the first draft of Aanora and two revisions. Right now, it’s in the hands of a beta reader. I expect that I’ll be doing at least two more revisions before it will be ready for publication. I’ll be very happy to start getting more of my fiction out in the world. Blogs: I’ve been participating in a blogfest called #We are the World Blogfest at the Eyes on Life blog (as Gina Hunter) for the past year or so, finding positive stories about humanity and sharing them on the blog. That’s all I’ve been writing at that blog and I’ve lost readership there. So, I will probably end my participation and return to my former commentary format with “The Successful Patient” posts as well as the current events and society commentary. I’ve been struggling with time — having the time to work on my fiction — and blog writing has taken more of a back seat to the fiction writing this year. I still continue to write posts here at Anatomy of Perceval on Saturdays. Essays/Paid Gigs: I’m only now beginning to figure out if I have the time to do some of these personal essays for ClassicalMPR or other online sites. So far this year, I haven’t had the time. Journal Writing: I’d hoped to establish a regular habit of journal writing every Sunday, but have failed miserably at this. Nothing has changed on this project — still on the back burner. Reading: My daily conmute during the work week gives me lots of time for reading and I’ve been enjoying that aspect of being back to fulltime employment. I shall exceed my 2018 Reading Challenge at GoodReads. Reading is such an essential part of being a writer, and I’ve enjoyed some wonderful and provocative books so far this year. You can check out my reviews of them on GoodReads, and give me a holler while you’re there! I’m really looking forward to submitting the two short stories and the Aanora novella, and spending the rest of the year on Perceval’s Shadow! Saturdays tend to be so crammed full of house chores, business chores, online chores, that my fiction gets relegated to the end of the day. Well, it’s happened again today and I’m a little annoyed with myself about it. So, this week, I am doing a brief blog post then moving on to work on a short story that screams for my attention for revision work. Perceval’s Secret has been nominated and is a finalist for the Reader’s Choice Award presented by Connections E-magazine. if you haven’t yet visited the site to vote — yes, it’s a reader’s choice, dear readers, so your vote counts — click on over and give it a vote! Yes, indeed. Last weekend, I listened to the satisfied and settled feeling in my physical body as I put the last polishing on the sci fi short story Light the Way. My next task is to find a home for it so everyone can read it. I have blocked out July 4 to begin work on the revisions of the Aanora novella. I am so excited. But it’s also another reason I’ve had so much to do this weekend that’s not writing related. My original plan was to have finished the first revision of the Aanora novella by the end of June — obviously I’m way behind with that. The revised plan: finish the first revision by the end of July. The second novel in the Perceval series has also been battering around in my brain and my imagination has been begging to come out to play with it. I realized a week ago, just after finishing Light the Way that I finished the first draft of Perceval’s Shadow about 10 years ago this summer. I don’t remember exactly when that summer. I have gotten it out at different times over that long period to work on it, read through it and make notes, and do some additional research. But now I’m feeling really ready to finally jump into its deep end and get it done. I expect then that next year the task will be to finish the first draft of Perceval in Love, the third novel in the series of five novels. And now, folks, on to writing fiction!